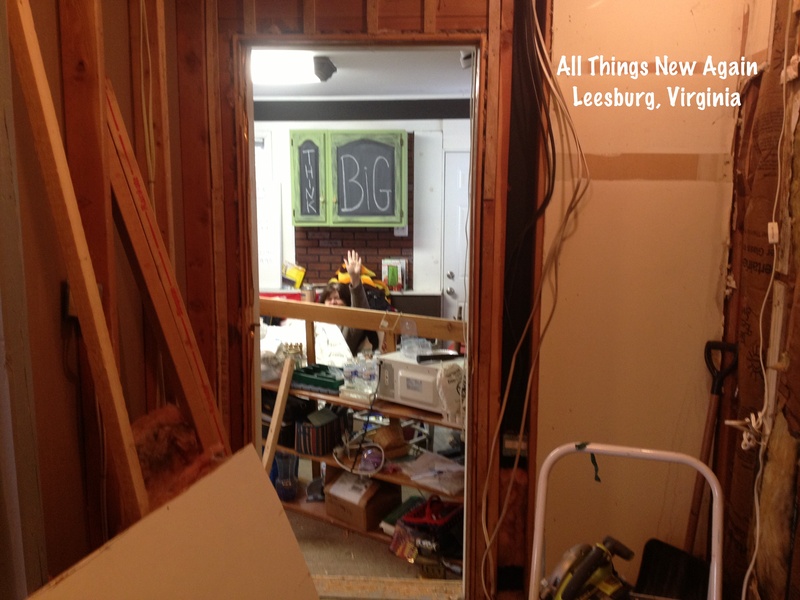 We are knee-deep in construction again at All Things New Again. Dave is transforming our back room into our new artist studio/classroom and converting part of our foyer into a washroom so we have a convenient place to clean brushes. 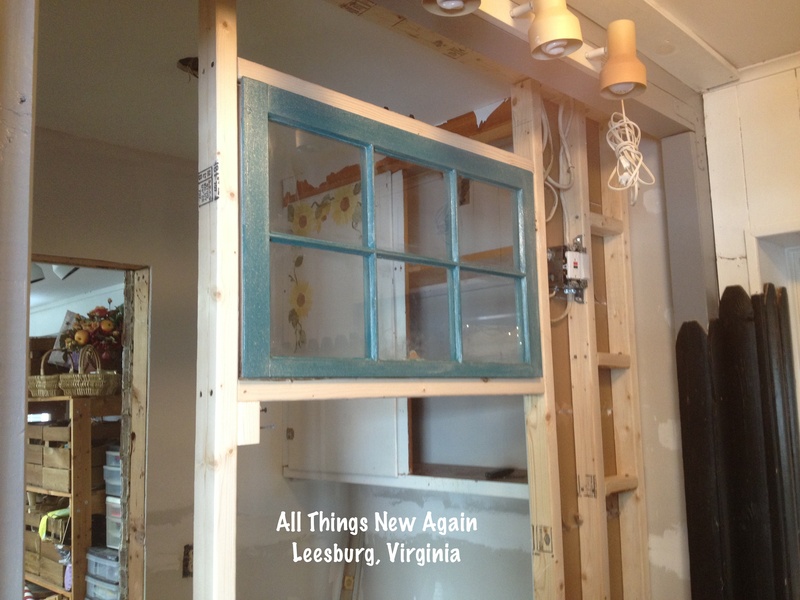 It is a good thing he is such a handy guy because this project is challenging all of his skills! I am never patient when we are in the middle of renovations. I just want construction to be OVER so we can enjoy the results. This project is especially hard for me to wait for because it is so exciting. Once this room is complete, we can start holding paint classes! I know a lot of you are also waiting patiently for our classes to start. We have developed the content for the first set of classes we are offering. While we are not ready to schedule dates yet, we wanted to share our ideas with you. We strived to develop classes that encourage beginners to give painting a try and help experienced painters bring their projects to the next level. We believe everybody has a creative spark inside. Let’s fire it up and have a lot of fun! If you are new to painting, this class is a great place to start. If you are an experienced painter and want to try out American Paint Company’s all-natural clay, chalk and mineral paints plus learn new techniques to enhance your projects, this class is for you too! Plus you will learn how to finish your pieces with a variety of APC products, including clear and dark wax, Top Coat and metallic micas. This is a 4-hour class and will be held on a Sunday afternoon. The cost is $99, which includes all supplies plus a project you will complete in class, take home and enjoy. Bring your own small piece of furniture (see guidelines below). We will provide all the paint and supplies plus individualized guidance and instruction to help you transform your piece into a masterpiece! Great for beginners or experienced painters who want to expand their skills. Furniture Guidelines: Due to space limitations, all furniture must be small enough for you to carry into the shop under one arm. Examples include: small table, end table, nightstand, chair, stool, small bookshelf. If it takes two people to carry, it is too big for this class! Also, due to time constraints, all pieces must be thoroughly cleaned and in good repair prior to class. This is a 4-hour class and will be held on a Saturday. The cost is $99 and includes all paint and supplies. Students must bring their own small piece of furniture to class. 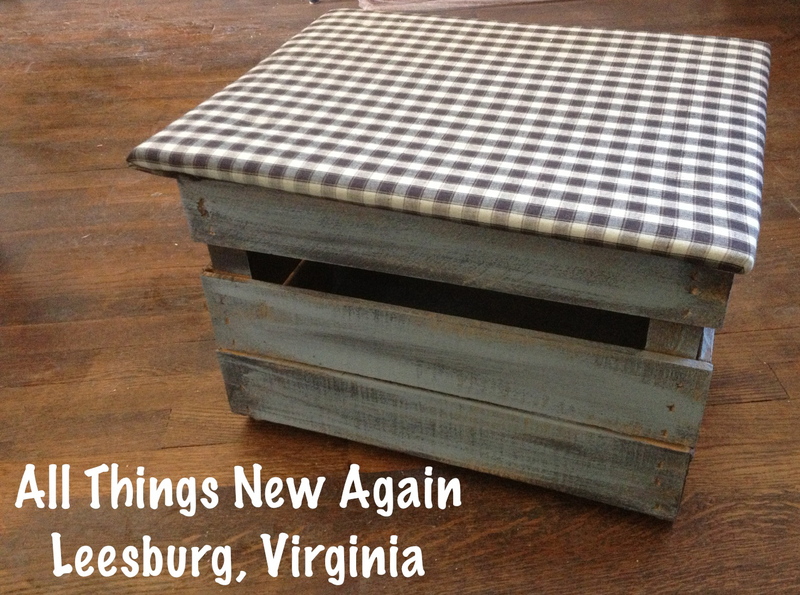 Learn paint techniques and basic upholstering skills to transform an ordinary crate into a stylish storage box like this one. This is a 2-hour workshop and will be held on a weeknight from 7 to 9 p.m. The cost is $65, which includes crate, paint and supplies. Students must bring 1/2 yard of fabric of their choosing to class. Painting is always more fun with friends! Join us on Thursday nights when we open our studio to you. Bring in any small project you would like to work on and we’ll all paint together from 7 to 9 p.m. This is not a formal class, but we will be available to answer questions and offer guidance. The cost is $35 and includes all paint and supplies used during your time at our studio. Bring a friend (or two!) and we will discount each person’s open studio session by $5 each. We are planning to host Thursday Night Paint Parties every week and will offer Intro and Paint Your Own Piece classes on a regular basis. We will spice things up by developing different workshops each month where we will focus on a specific project like the Create A Crate Workshop described above. We have many ideas for other workshops, but we would love to hear from you. If you have an idea or a project you would like to try, please let us know. Also, we are happy to hold a private class, workshop or paint party for you and your friends at any time convenient for you. We need a minimum of 5 people to sign up and we will work with you to develop a course that everybody in your group will enjoy. Now all we need is for this room to be finished! Sure hope I can make it !!! !